And now for that giveaway I mentioned . . . Win Crocs for a Year! One lucky winner will receive 12 vouchers, each good for one free pair of Crocs shoes. Vouchers must be redeemed within 12 months from the day the winner is chosen. Use the widget below to enter. There are 3 optional entries. Good luck! Fine Print: NO PURCHASE NECESSARY TO ENTER OR WIN. A PURCHASE DOES NOT IMPROVE YOUR CHANCES OF WINNING. Open to legal residents of USA who are 18 years or older. Void where prohibited or restricted by law. The winner of the Sweepstakes will be selected in a random drawing from among all eligible Entries received throughout the Promotion Period. Odds of winning will vary depending on the number of eligible Entries received. Winner will be notified by email at the email address provided in the Entry Information on or about 48 hours after the random drawing. Potential winner must accept a prize by email as directed by Sponsor within 48 hours of notification. Any winner notification not responded to or returned as undeliverable may result in prize forfeiture. No substitution or transfer of a prize is permitted except by Sponsor. Thanks to Crocs for sponsoring this post! Love Crocs!! I would love to have Crocs for a year! I think they are all cute !I just saw the yellowish green ones on today show this week ! I just bought two pairs of crocs and I love them. I commented on a cute pair of flats my friend was wearing and when she told me they were crocs, I was shocked. These are not my hot pink yard shoe crocs from years ago. One pair I picked up is a cute pair of flats with a snake skin design and the other pair is a wedge in a very neutral see through gray. I have never worn Crocs but these look cute and comfortable. I will have to check them out. Love the colors in this, so summery. And who’da thunk…Crocs?! So cute! I have never been a crocs fan before but these wedges may change my mind—it’s the floral print that looks so nice. So I’ll say this Leigh Style is my favorite (I also like the 2 strap one!! I had some really cute Croc sandals a few years ago. They didn’t have a buckle, just a stretchy strap at the heel. One day I stretched it too far and it snapped. But they were cute while they lasted! And they did last a couple of summers. I am all about the comfort, but they’re super cute to boot! I have always been a Crocs fan. My favorite are the Mary Jane style. The color is beautiful on you. I’ll have to check out the cute crocs. Love how the tee plays into the shoes! Very cute & comfy! Checking out the Crocs too! Crocs – who knew???? So cute! Love this color and pattern! Love these, so super cute, I was looking yesterday at the blue & green pair, when you shared them. Really cute & I bet super comfy!!! I wear my Crocs almost every day! I have foot problems and they are some of the only shoes that don’t hurt. I have some low wedge sandals, but would love to have some choices! Beautiful crocs! I really need to do some shopping. I love the Women’s Cyprus IV Sparkle Leopard Heel. These flower wedge crocs are pure perfection! Style and comfort is what I look for these days!! I could wear crocs everyday for a year – no problem!!! Just bought my daughter a pair, she’d been begging for months and she loves them. You’ve convinced me I will need to try them as well. My favorite style of Crocs is the Women’s Leigh II Ankle Strap Wedge in Black! I would definitely be willing to try them if they’re comfortable. I haven’t looked yet but I haven’t purchased crocs before because they only came in whole sizes. Can’t wait to look and see if they offer half sizes in this wedge! Very cute outfit! Who knew crocs could be so cute!!?!? Thanks Jolynne for giving us great fashion every day. You always look wonderful even when you don’t like something you put together! 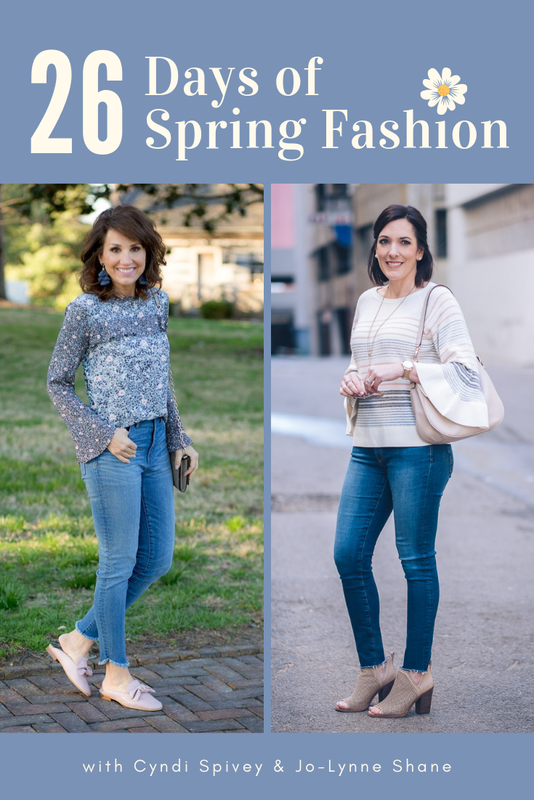 I have not worn Crocs but I have been seeing some really cute things that I would like to wear, including the sandals you have on in this post. I love the Crocs! I’d love to try these shoes. My daughter wore the huge, clown looking crocs for years! They were cute on her but I just couldn’t do it, but these are really cute!! Love your blog! Love these cute Crocs! Crocs sure have come a long way! I like the Isabella jelly flats. The crocs are adorable! Fingers crossed I win! Lol. Aso wanted to say I bought a blue jean “skort” last spring. Same length as your skirt–cannot tell there are shorts under it. I wear it all the time???? I wear Crocs almost every day!! They are the most comfortable shoes I wear!!! I just ordered the Leigh wedge in a pretty raspberry color – couldn’t resist after seeing yours. Crocs are the best. Great styles, colors,and best of all great fit. Sure hope I can win the Crocs. They can go with everything you wear. I love the wedge style Croc. It looks so versatile, and pretty. I wear Croc clogs for work. If the wedge is as comfortable as the clog, and it sounds like it is, then what a wonderful wedge! I love my Crocs sandals! I have 3 pairs, 1 a flat black sandal with a medallion center, 1 brown sandal with slight wedge and crisscross straps and third is a cork wedge with brown leather like straps. Very cute and soooo comfortable. They work well for my finicky feet! My daughters like to steal them from me now. Love the outfit! I found a blue jean skirt that length at a great price at Kohl’s. It is Sonoma brand. Hope that helps someone! Thanks, Sandy! I’ve been looking for a more affordable one to recommend. Yes! It fits well, is a nice length and has some stretch to it. I haven’t washed it yet so I hope it washes well. Those shoes are adorable and the comfort of crocs…..yeah! The Crocs are so cute! I sure wish they were made for narrow feet! Darling outfit! I’ve had flat styles of crocs in the past, but after seeing your post I may have to try this style. Very cute and they look comfy. I am all about comfy nowadays!! These are my new favorites! As a kindergarten teacher I am a big fan of Crocs! I have some cute wedges and flats that I wear everyday. They are so comfortable and easy to clean- two very important things when you work with kids! My favorite Crocs are the Classic Sandal—I’m on my 2nd pair now. These wedges are adorable. These are adorable and just the style of Crocs I prefer. I like a dressier/casual look and love the low wedge heal. I have a wedge pair of Crocs from a few years back and wear them often! Thanks for the opportunity to enter the Contest! As always, you look adorable and so put together! I’d love crocs for a year!! This is so convenient, plus those wedges look so comfy! Love these crocs – I’m so glad you mentioned the moderate wedge being better than flats for feet issues – I thought it was just in my head! hahaha These crocs look perfect for my achy feet. Thanks!! I saw these Crocs on Instagram – LOVE them! I have never been a crocs fan since my feet are more narrow, but I could see wearing those. So cute! Those are adorable! I have a pair of the Kadee (I think that is what they are called) that I like! I didn’t have any idea crocs had anything cute and stylish! I’m going to check them out. I would wear those crocs!! You look great! I love all your fashion styles and I love Crocs! I have runners knees and can wear Croc wedges all day without pain. They look stylish with dresses or jeans. You are right! The sandals look great with this combination. I didn’t think I liked Crocs but these are cute. They look really comfy! Those cross are SO cute!! I have never tried Crocs, but I may have to start! The new Crocs designs are so adorable. I would love to win! Crocs sandals… I just tried on a heeled pair at TJ Maxx. So comfortable and light, I feared I might turn my ankle. May have to reconsider. Such a great look, JoLynne. Hoping to find a similar skirt. I’ve never worn crocs but those are adorable! I will have to check them out! So cute. I love these sandals… hope I win! I always keep a pair of old style crocs in bright orange in my classroom for those times when my feet just can’t stand the concrete floors anymore. The students get a kick out of them. I love my croc wedges because they go well with just about anything from dressy to casual with the synthetic leather upper you spoke of, but the footbed is like a cloud under my feet. Comfy and stylish. Good combo!!! Fully one third of my closet is coral. Love these floral crocs! Haha, I think mine too! So cute! I love the colors in the shoes too! Nothing beats a comfortable pair of shoes. Thanks for sharing. Love the Crocs wedge sandel, they do look extremely comfortable and stylish at the same time! Love Crocs and would love to wear them all year! Awesome giveaway! I start a new job at the end of the month and this would be perfect to get some new and comfy shoes in my wardrobe! I love the sandals you are wearing I the nautical blue! I love how comfortable and light they are on your feet… my husband also loves the flip flops and the loafers for men. Love the crocs!! The wedges are definitely my favorite! Supe cute Crocs! I love how they massage your feet as you walk! I love crocs, I have the slip ons, but would really love to try the sandals! My favorite style of Crocs are the Mary Janes. My sister told me she loved her Croc wedges and yours are super cute so I think I’ll give them a try! They are cute & different from my garden work crocs! Jo-Lynn, I love your blog and Pinterest page. I follow both. I have these in black and they are so comfortable and cute! Love the Croc’s. Thanks for the opportunity to win! Cute and comfortable…a win – win! I love the ones you are wearing but honestly even the ones that aren’t the most fashionable are so comfortable!!! Love the outfit!!! Going to look for some crocks and blue jeans skirt. I was wondering if you ever do anything on undergarmets? I have been struggling for years to find the ” perfect “bra. I have been blessed with a chest. Was wondering if you had any suggestions. It’s hard! I usually go to Nordstrom and they bring me a bunch of different ones to try. I would choose the hazelnut/gold wedges. Style and comfort are equally important and these have both. I am really really loving those wedge sandals you are wearing! Cute shoes! Had no idea Crocs made shoes like this. I love the traditional style Croc slip ons; however, the wedges are very cute! Thank you for the chance. These sandals are adorable! I also love the whole outfit! perfect for summer! I have a pair of black crocs for the garden but the ones you have are darling! Thanks for letting us in on the secret! Great summer shoes! Great summer outfit! I’ve had the A-leigh Crisscross Wedges on my radar for weeks! So cute and hopefully comfy! Seriously wasn’t even aware Crocs made shoes like this. LOVE! Those Crocs look comfortable! I bought a ballet flat style a few years ago but have never tried their wedge styles. I love wedge sandals they are always so comfortable and cute with just about anything you wear. I love the whole outfit. What a great giveaway. I could really see my daughter wearing these for her senior photos this year. Would love to get the wedges that you are wearing as well as black and a neutral color. And maybe get some more flip flops!! Oh my! Those wedges are really cute! I swore to never own a pair of Crocs, but you could get me in those! Very cute! This outfit would go well in my casual office setting, too. I love the coral pair you’ve featured!! I didn’t realize Crocs made such a wide variety of shoes. I might have to pick up a pair – love the wedge sandals you featured. I have several pair of crocs. I love the ballet flats! I wear them to work all the time. I discovered heaven on my feet when I bought my first pair of Crocs. I stand on my feet all day and would LOVE more pairs!! I love your outfit, and those crocs. 🙂 I still tend to think of crocs as they were when they first came out, but I guess they have changed quite a bit since then! I didn’t realize Crocs had branched out into so many cute styles. I would love to try the Women’s Walu II Canvas Loafer. Thanks. I just bought a pair of Crocs wedges after experiencing a lot of foot problems. They are such an affordable cute shoe and they don’t hurt my feet! I would NEVER have believed these were Crocs! Now I think I need to go try a pair. Love this Leigh style! Guess I need to wander into the local Crocs store. I had no idea! Crocs are so comfy… And these ones are so cute! I love the whole outfit. I would wear those crocs although I have never worn a pair before. I love wearing Crocs to work. They are so comfy. I have a pair of the ballet flats and you would never guess they were Crocs. This would be a great give away to win. I’ve been eyeing that exact pair for a couple of weeks. The kadee is my go to classic flat and everyone is shocked to hear they are comfy crocs! Super cute shoes. I was not aware that Crocs made these. I am going to definitely give Crocs a chance again. Love Crocs. I wear the flip flops all the time (Capri IV). They are cute and don’t look like what everyone thinks of Crocs. They helped me a few years ago when I had plantar fasciitis. I had no idea crocs were cute! Hope I win! I’ve never tried Crocs. But now that they have some cuter styles, I may have to give them a try. Cute outfit and something I can easily do! I love it! I on one pair of teal colored Crocs. They are flats that have cut-outs and peep toe. Have so many compliments on them. Love your blog! I have a pair of wedge crocs and I love them. I’m a hairstylist and I can stand in them all day. Plus they’re so cute everyone is shocked when I tell them they are crocs. I have LOTS of Crocs! Way more than I’d like to admit-ha! They, Danskos and Sketchers are my favorite for my finicky feet. My newest Croc fave is the Two Strap cork wedge I bought early this sprin, which i no longer see on their website. I also have the shoe you styled, but in the beige fabric. Now I wish I’d have chosen color. Oh, well! Super cute outfit!! Love these crocs! You showcase such cute clothes JoLynne! I love Crocs. I wear them 95% of the time. The Capri us my fav style. I have 10 pairs of this one style. So cute! I love the Crocs ballet flats. I love the Leigh II Ankle Strap Wedges. I love your blog too. Thank you. I wear the Busy Day croc every day! So comfy and cute. My husband lives in the Santa Cruz loafer. So we could definitely use a years supply! Those sandals make that outfit so cute! Crocs – who would have thought? Will definitely check them out! Very cute. I wear a lot of coral, so your photos appeal to me. But I also like the green… choices, choices! I’m always amazed the people have such a narrow image of Crocs. I’ve been wearing them for years and get compliments on them all the time! My favorites are 2 pairs of Kadee flats (one black and one purple) and 2 pairs of Carlisa flats (I get complements every time I wear my animal print pair). Love Crocs!! I have finicky feet, too. Would be fun to have some cute, comfortable wedges. The Sanrah Circle Bow Wedge Flip looks cute! My favorite pair of Crocs are cute black flats. They look nice and are easy to slip into when running errands on the weekends. I like their classic flip in the ultramarine color! I have the Leigh version in black and they are very comfortable! These are so cute! I never would have imagined that they were Crocs! Wow! Wow! These look nothing like the crocs I remember! May have to revisit their products! I would wear those, they’re not exactly neutral, but so cute and summery. They make a fun statement. I like your “Mom-about -town” comment. I have a pair of crocs that I wear every day in the house since we have all tile floors. Glad to see they are making more “fashion” conscious styles now! Very cute outfit! I HATED the original crocs. Not just from a fashion standpoint, but found them incredibly uncomfortable too. They just don’t fit my foot right. Hopefully the new ones would be better lol. I think I’d try the ones you have but in the tumbleweed/espresso. Crocs sure have changed over the years! I really like the Leigh two strap graphic wedge, the capri v beaded flip and the leigh ankle strap wedge! I’ve been enjoying your blog for a couple of weeks! Love the crocs and I have a blue jean skirt I wear all the time! My favorite is the Women’s Walu II Canvas Loafer. I love their flip flops with the fabric straps. I have 2 pairs! I buy a new pair every year. Never a big fan of the original but love their flip flops. I’ve been eyeing crock wedges lately – cute! Those shoes are sooooooo cute. Not like the Cross I remember! I love Crocs and the wedge sandals are really cute! I would love to win some! I love the wedge sandals. I like the Crocs flip flops, it’s great that they have so many styles. I am loving crocs these days! Have found several sassy new ones! I love every pair of crocs I’ve bought! As a mom of 5, I can testify that these are the best shoes on earth! Winning this raffle would be a dream come true! I love….love crocs and have always been a huge fan! And I love…love your blog!!! Have a blessed day! Thank you, Susan! You too! Love your blog and casual style; fits my own. Sometimes things are out of my price range so I look for another alternative or look in my closet, would never make a nasty comment to you like you mentioned others did. Just recently discovered crocs had styles other than those clogs. Bought a pair of rose colored slip on wedges that were on sale (didn’t want to buy another pair that hurt after a short time) and love them. Great for the warm weather and for those with foot issues. The shoes for a year would be fabulous, but even if I don’t win I’ll continue to enjoy your blog and look forward to reading it. Thanks so much, Michelle! 🙂 Glad you love the Crocs! Thanks for the giveaway. I’ve never had crocs but Iove the 2 strap wedge, may have to order them! I had no idea Crocs makes anything this cute! I will def be checking them out! I have on my Dual Comfort Crocs right now! Love them!! Most comfortable flip flop ever. Crocs sure have come a long way, those are so cute!! I love those wedges you are wearing. I’d get the tumbleweed color.